This product does not taste as good to me or mix as well with water as the chocolate flavour. I don't feel very full for very long but I guess it is expected when you're drinking water and minimal calories. It's still decent but you really taste the stevia so if you dislike that taste, I'd buy the chocolate. 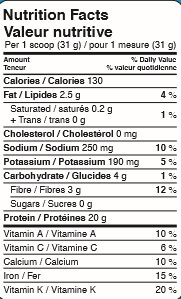 My favourite protein powder. It's easy on my stomach and not too sweet. Even good on it's own with water. 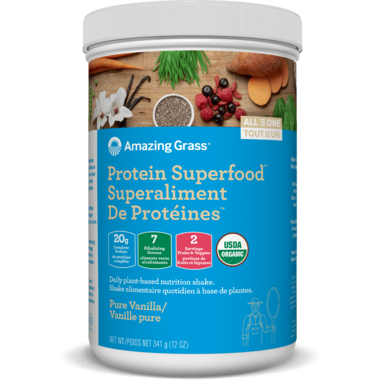 My favourite protein powder, and I've tried a lot of vegan protein powders! I don't find that it has a green taste too it, and it is not overly sweet. Blends will in my vitamix with almond milk and bananas. Not gritty at all. Slight 'grassy' taste to it. I guess that's expected. I couldn't discern a 'vanilla' flavour either. I didn't mind that - but if you're looking for something sweet, that might taste good with just water, this probably isn't the right choice.